Find the right storage solution isn’t always as easy as setting up a rack or shelf. Some of the goods you need to store or display are long and awkward to shift. They could be 3, 4 or 5m long and there are no shelves that can easily accommodate that kind of length. It’s also a valuable space to take up. We here at Workplace Depot believe that best solution is through vertical shelving. 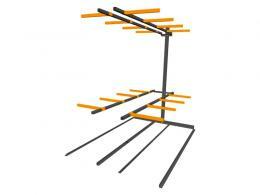 The cantilever shelving is the best way to get all those long items up off the ground and into one convenient place. 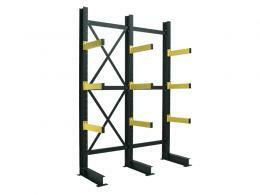 The racking solution will suit any warehouse or store. The cantilever racking comes in a few different varieties that all accommodate those awkward lengths of pipe or timber or conduit. They can display different heights and they are designed to not collapse under the weight. The arms on the racking keep everything neatly arranged and ensures that every length doesn’t slide off and damage anything else. This cantilever racking is incredibly sturdy and won’t be flimsy like you might from other lesser racking systems. In order to give your customer easy access to the goods, you need the solution that keeps everything upright. Your customers can easily see which lengths you have in stock as well as the other options available. Get your store in order with the racks that give you more room to move and display your goods. 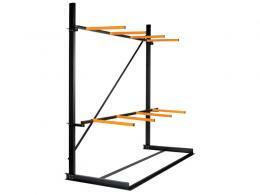 As of yet, we haven’t seen another version of these racks that is durable and affordable as what we offer. Everything we have in this category comes with a warranty on the parts and labour for 12 months after the sale. It’s our commitment to giving you the best storage solutions for your workplace.